5453 N. Blue Lake Rd. Located on a 240 acre lake, just 20 minutes north of Fort Wayne off Hwy 33. Camping Cabins - One rustic cabin accommodates up to 5 people and consists of 3 beds, table and chairs, picnic table, electric outlet, porch and fire ring. The other rustic cabin has a queen size bed and a couch. Bring your own linens. Located close to the bath house. 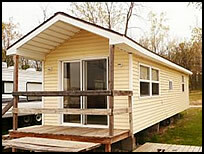 Traditional Cabins - Park models offer all the comforts of home. 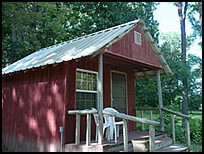 The park model cabin features a living/dining area, kitchen, bathroom, master bedroom, loft and porch. The park model trailer offers all the features of the park model cabin except the loft. Bring your own linens.